Look what followed me home :)its a 1965 glasspar sea fair sedan in pretty nice shape. The plan is to polish her up and put some new carpet in it for now, slap a 50hp merc on the back of her and enjoy it for a little while. Later down the road I hope to repaint it and make her look like its brand new. Thankfully I was able to buy my sea fair sedan and glasspar emblems back from the guy on ebay well at least I have them now. Nice score Jetflite, she looks to be in pretty good shape! I love those old "cruisers". Thanks for the complements, I'm pretty excited about this one . I did have a couple questions for the experts though. Some one told me that in 1965 glasspar started using solid fiberglass floor and stringers so they will never root. Is this true? The floor feels very solid so I'm not to worried about it I was just wondering. The other question is the plywood transom looks fairly solid and it isn't bowed out, but the fiberglass hull of the boat does not seem to be attached to the plywood, is this normal or is it some thing to be concerned with? Also I was wondering if a 2001 75hp mercury four stroke would be to heavy for the old girl? well, half of the info is true. the stringers are made of fiberglass. the floor is plywood with a glass overlay. if the transom is solid then i would think the motor weight would be ok. two of my sedans have merc 1150's on them. a 115 hp will push a sedan over 40mph. your boat is very complete,still has the cabin door,cushions and headliner,swing away helm seats and the full set of canvas. what does it have for the rear seating? if it is necessary to replace the transom,then you will be happy to know that the sedan's transom is a fairly easy one to do. remove the rear seats,splashwell and you are there. the Glasspar owners association is a website devoted to the glasspar boats and would be a good resource for you too. Very nice looking Seafair Sedan Sir! My Wife and I also purchased a Seafair Sedan last year but it was a 1960. It was in great shape but had the usual fiberglass cracks on the hull and stern so we decided to do a complete "refurbish" of the hull. We just got it done and I will post some pictures up here for you. 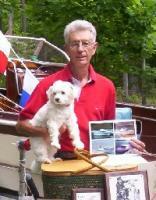 Skipp has given you great advice on the outboard motors for your Seafair Sedan. I think that "Mercury" 75 H.P. Outboard Motor you mentioned would work fine on your boat. We have purchased a 2009 Mercury 90 H.P. Two-Stroke for our 1960 Seafair Sedan. As Skipp said there are many Seafair Sedans with the older "tower of power" six (6) cylinder Mercury Outboard Motors ranging from 100-115 H.P. Good luck with your boat Sir. Thanks for the replies, I see what you mean with how easy it will be to remove the transome. It looks like the plywood for the transome may have been replaced in the past, but I am not that impressed so I will be redoing that. I was wondering if I don't get the 75hp will a 50hp push the sedan on plan? For now though I am working on my brothers project so I can get that out of my garage I will post that on the projects page. hi,hope the info provided so far has been helpful. i feel that fifty hp would be at the lower limit. with just a couple of people on board it might plane off,but with four adults and and other gear i doubt it. guess it depends on your intended use or any limitations on the body of water where you are planning to use it. Sorry late to this but that's a GREAT find and with the canvas too!!!!!!!!!! Thanks for the complements. Yes skip the info you guys have given me has been a great help. As for your question about the back seats, they look original but the mounting brakets look like they have been altered for some reason. I will post pictures this weekend when I get a chance. Do you by chance have any pictures of what they should look like. I finally got a chance to take a couple pictures of the back seats. For some reason I don't think 2x4 and 4x4 leg under the seat is stock so what are the back seats supposed to look like? you are not going to believe this,but the 2x4 is part of the factory setup. the 4x4 is not. i have been going thru the pics of sedans that i have gathered and it seems the rear seating was not at the top of my list. 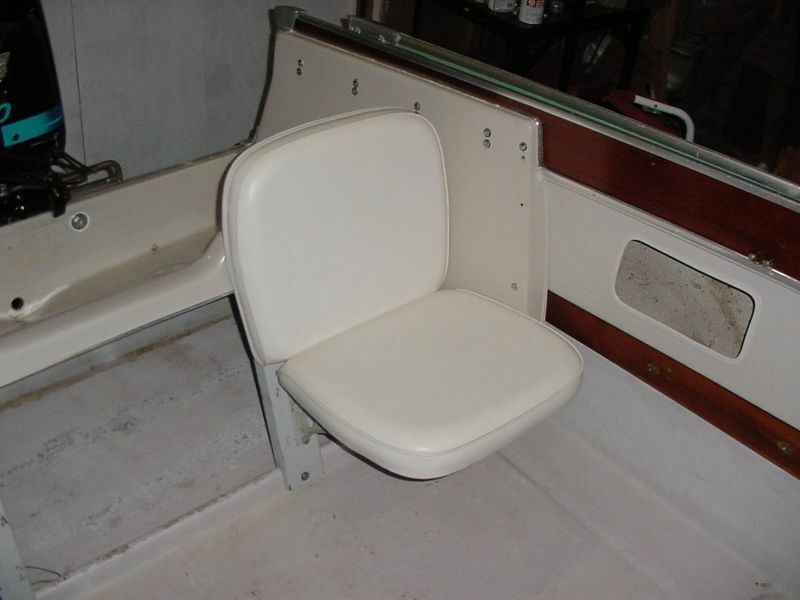 there was a standard seating package where the seat is supported by the cast support arm attached to a 2x4 on one side with the other side of the seat being supported by a lip molded into the splash/motor well. on later boats there was a deluxe option. this was larger seats mounted on boxes with a fold up table between them. this table also served as a cover for the opening to the area under the splashwell. i did find a couple of pics for you. naturally some homebrew solutions have been made too. benchseats with storage under them is a popular choice. i liked Ric's solution also. he made boxes for the seat support and then hinged the front of the seat. 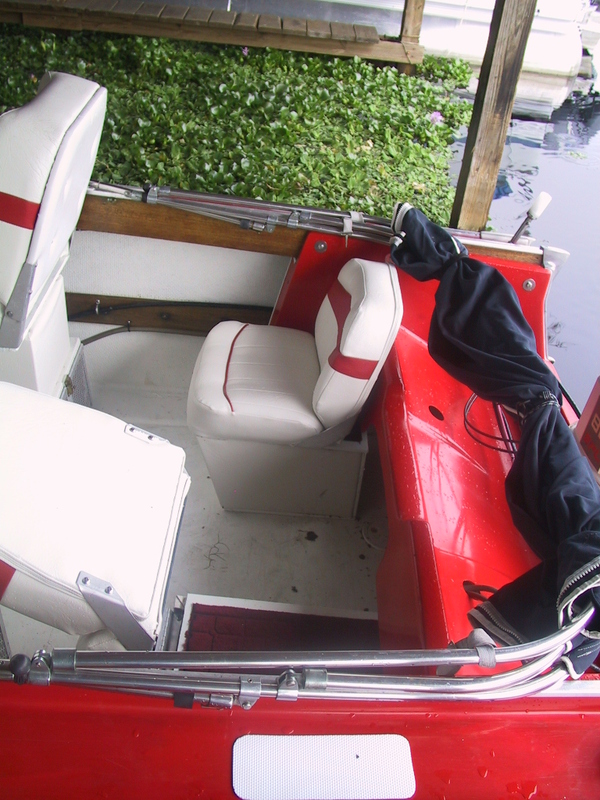 when the seat is folded forward,the support becomes a handy step into the boat. Original Seafair sedans were equipped with Mark 55's or Fat Fifties. They performed well. Modern 50's have much more power than the old 50's. Caution: The splashwell and cockpit combings are integral parts of the transom structure. make sure they are in really good shape. I would not put carpet in as it keeps moisture on the plywood floor and will give it more time to seep through openings in the fiberglass covering and rot your floor prematurely. Congrats! That is the most complete Seafair I've seen yet. Those side covers in the cabin with the G molded in are quite rare. First ones I've seen. I hope Brian reproduces those! J.F. CONGRATS, on a nice nice find. I recall seeing a C.L. ad in Wis for a good Sedan.. Our 1st Blue one was a 1962 & had those two rear seat Blue circle perforated metal brackets.. I raised them up a tad & used a bench seat in the rear... YES, members have been searching / trying for a better usage of space for rear seats ideas. Need to get access under the splashwell for gas tganks, / battery , etc..
. I had a Two cyl 55hp OMC, & with two people aboard , yes it would get on plane. .. That BROWN seat pic above looks famialar.? A moveable / collapse seat is not a bad idea either. There were a few Sedans in the 2012 Fiberglassic calendar for last year. They are a very nifty model , with nice lines.. 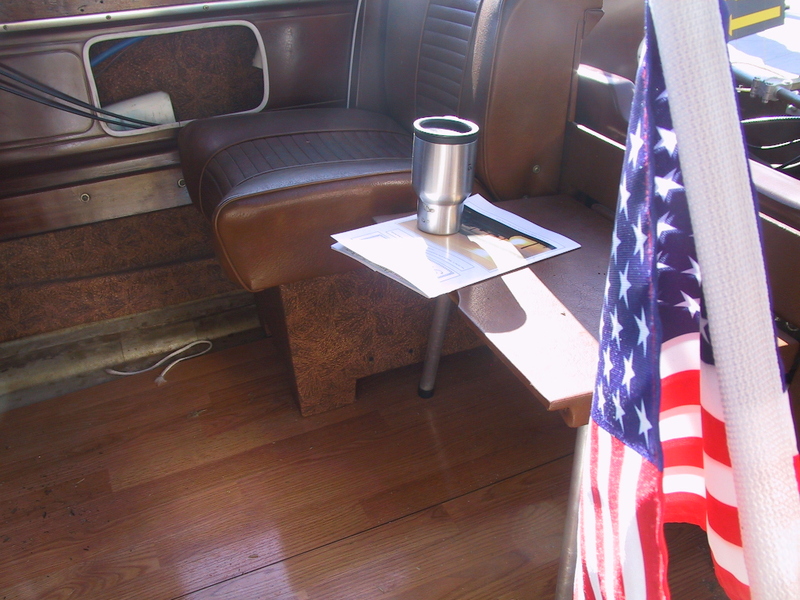 I am anxious to get ours refurbished for 2013 as I have two sets of rear camper canvass to sample for overnight usage. east Tenn here , ther are a few Sedans in the Chicago area , show condition. Thank you guys for all your responses. You've given me a lot of good ideas for the back seats, I really wasn't a fan of them. I think I should be able to come up with something cool and functional. I'm glad to hear that the 50hp is going to be big enough. 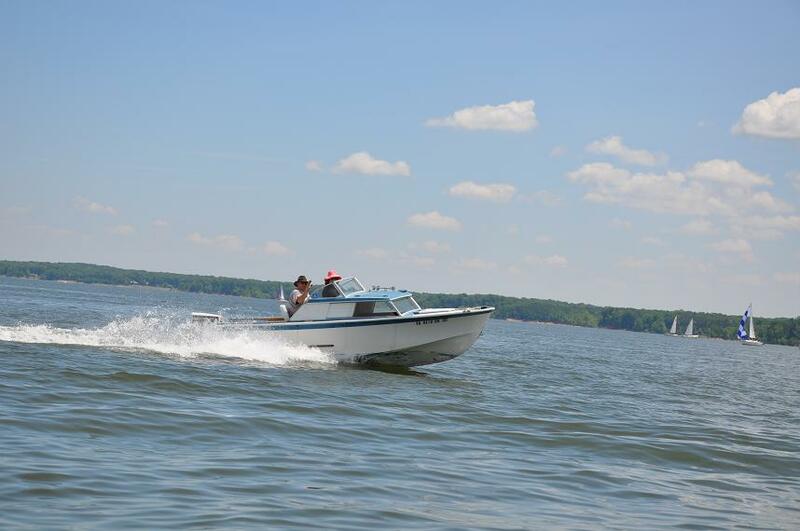 For now it looks like that is going to be the motor I'm going to have to use, but I'm still going to be on the look out for a good 85-115hp to upgrade to The more I see pictures of your completed sea fairs the more I have been getting excited to complete mine and get it on the water. Well it looks like I will not have to worry about that tiny 50hp merc to push the sea fair around slowly, because I just picked up a 140hp mercury TOWER OF POWER with power trim . Also I got a second power trim unit in the deal which will be going on the jetflite all for a fantastic price. I could not be happier right now. Pictures will come later once I figure out how to get that beast out of the bed of my truck. Now for the important question is a 140 merc that much heavier than a 115 merc and do I need to beef up the transom to take the extra weight if there is any? With the help of my father, brother, and a lot of grunting we got the motor out of the back of the truck today. The guy who sold it to me said the previous owner took the 1400 stickers off of it and put 115 stickers on the motor, because his boat was only rated for a 115. Is there a way to tell if it is really a 140hp? I can't seem to find any markings on the block to indicate anything. If it is a 1400 it is a 1972 according to the serial number. The motor in the back is a mark 78 with no lower unit and froze up. I got it with a mark 75 that it next to the mark 78. Some day I hope to get the 75 going. The 1971 merc 50hp next to that I am putting in the basement and hope to get it running this winter. Very nice looking engine Sir! There is nothing better looking than those older Black "Tower Of Power" Mercury In-Line six cylinder outboards! It has been a while but I have been working on the sedan, and I am hopefully maybe 2 weeks away from getting the old girl back in the water. I had to replace the transom and 4 feet of floor. 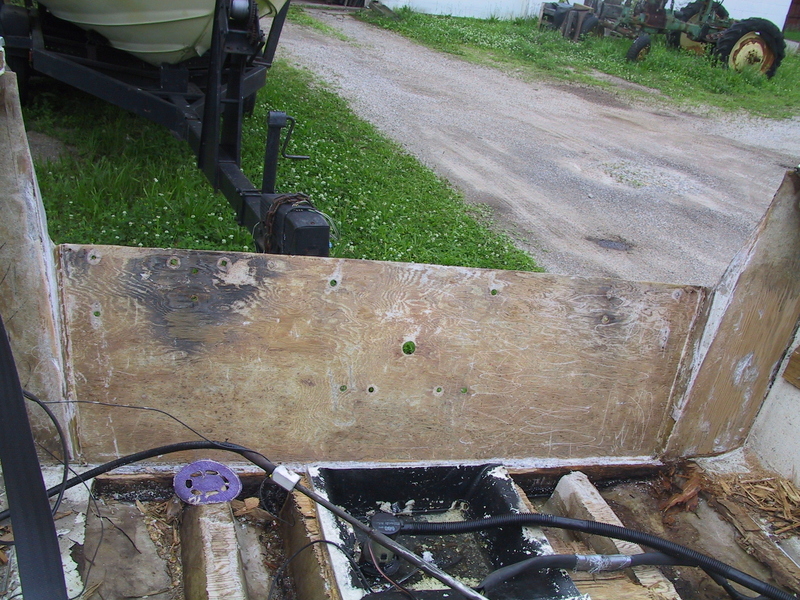 The transom had been replaced once before, but unfortunately the PO didn't laminate the plywood for the transom to the hull and left a bunch of old holes unsealed. So water easily got in-between there and rotted all there good work away. I will post more pictures tomorrow. Glad to hear you are making progress on your Seafair! Post some more pictures for us when you get a chance. Here is a picture of the floor and transom completed, I put some braces on the transom because of the large motor I plan to use. The previous owner used interior white paint to cover up the zolatone. The good news is, it can be washed off with water and a brush, so I'll try to get as much of the white paint off as I can before I put the carpet in. After about 6 hours of scrubbing with soapy water and brush, I have been able to remove most of the interior water based paint from the boat. Hopefully this weekend I'll be able to install the carpet and put the splashwell back on. Then its off to pick up the 140 hp TOWER OF POWER! If you look at some of the pictures I first posted you'll be able to see what it looked like before. Outstanding job there 1968jetflite! Your Sedan is in considerably better shape than mine was in when we got it. I want to hear how you like it once you have it back in the water. These for their size are a fun boat and handle very well. Looking good JetFlite, she's coming along nicely! I got the motor mounted and running. Took the glasspar out to the lake for her maiden voyage and things went well for about 8 minutes. Put the boat in the water and it started right up, then I took it out for a quick spin so the wife could take some cool action shot before she climbed aboard for a nice spin around the lake. Well we got the cool action shots, but as soon as I came back to pick the wife up, the motor died and I barely got it to run enough to get back to the pier. Not sure what is wrong but I will do some tinkering tomorrow and see what happens, if anyone has any suggestions I would really appreciate it. Despite all that the 140hp tower of power when it was running, took off like a ROCKET! Which has really got me excited about all the fun we will have when I do get it running properly. Great to se that you finally splashed the Glasspar. Great looking shots of it on the water. I hope you manage to get the motor up and running proper for the weekend. Skip. I hope the motor fix does not take to long. You must be chomping at the bit to get her back in the water. Beautiful shots! Looks like you had a couple of sweet runs before the motor acted up. Some of us have found out that our wives generally like these boats. Good luck with the motor. I never had luck with vintage motors. #seabuddy says... Wives love that model. Well it turned out that the middle carburetor float was stuck. At least it was an easy fix. So the wife and I went on a nice slow cruise around the lake, and the wife loved it. The motor did die once about 20 minutes into the cruise, but once I got it restarted it ran fine. If I'm lucky this weekend I will be able to do some speed trials, and see how fast a 140 horses will really push the sedan. Great pics, glad things turned out to be an easy fix. 140 ponies should push her along at a good clip. Well I got all the wiring redone and surprise, all the lights work and the horn sounded. I think I'm going to officially call it a "working project boat" instead of a lawn ornament I hope to some day put a motor on and float LOL. On another note I helped my brother today finish fiberglassing in the floor and transom on his seafair sedan. Hopefully he will have his boat ready for a sea trial before the lakes freeze here in the great up north. The first Seafair sedans were almost always powered with Fat 50's. They performed well but not fast. Those fifties had less power than modern fifties. Well I thought I would update you guys on my planes for this spring, as I sit and watch it snow again outside. Last time I took the seafair out to the lake I noticed that the trailer really is quit rickety, and tends to sway the back of the truck around, not dangerously but enough to notice it. 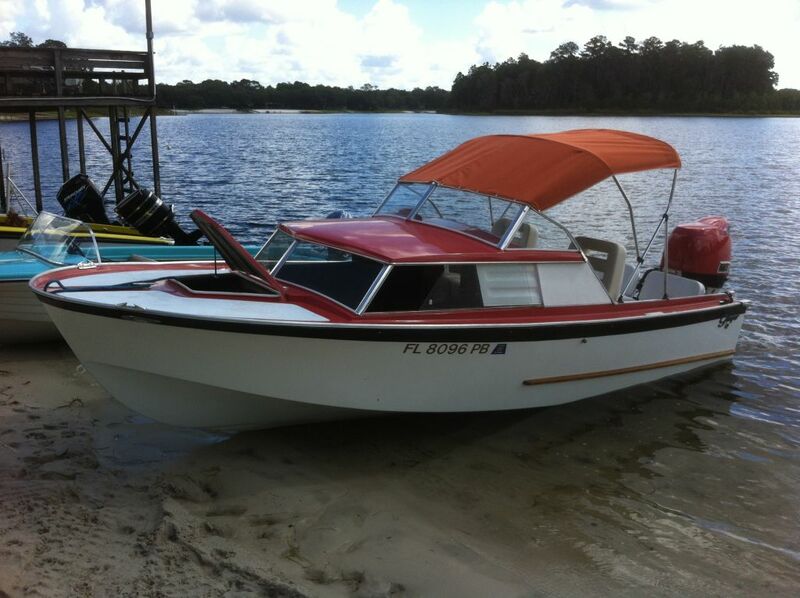 So this fall I managed to acquire a 1983 Larson open bow in terrible shape with a nice roller trailer and a 115 tower of power for only $250. So as soon as the snow melts I will be switching trailers and possible upgrading to a newer tower of power. I believe the 1972 140hp and the 1983 115hp are actually the same horse power at the shaft. 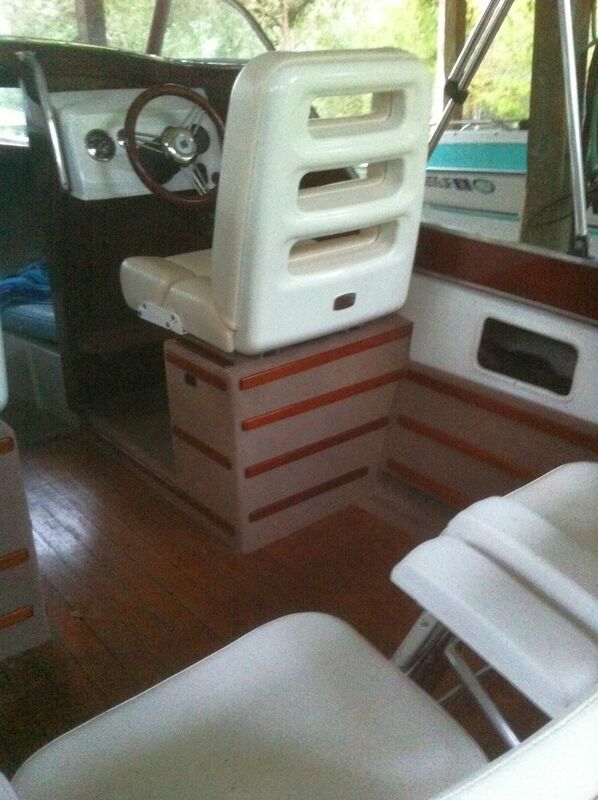 Also I still need to install the rear seats, and refinish the mahogany.